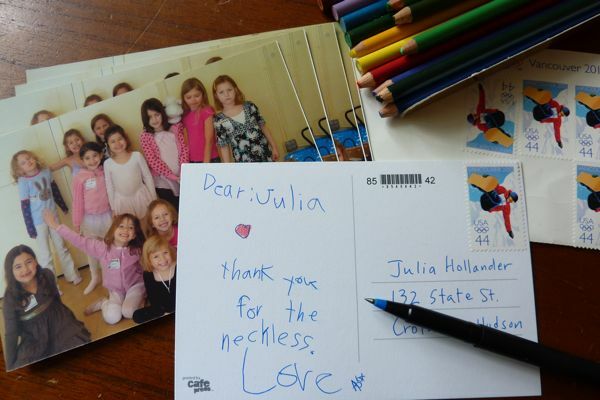 Quickest way to get your kid to write a thank-you card after the birthday party? Turn a group shot of the guests into postcards (we do it at cafepress) and watch her bang them out before breakfast. I save one for a keepsake, but the birthday girl gets to keep any extras for pretend play. hi what is your facebook site? This is such an awesome idea!! I just found your blog from ohdeedoh and love it. This is such a fun (and yet simple!) idea… I love it. Thanks so much for sharing! We’re expecting our first child this summer and I love the idea of doing this for shower thank-you’s. Love this idea. Just brilliant. Fabulous idea! Now I just have to make sure to remember it when the next birthday or gift receiving period comes. thanks! Salut all! Great web page, despite the fact that certainly not all of it is actually working in the right way! But oh well as that is up to this administrator to repair … Anyway, I just wanted to talk about this interesting theory concerning relationships that I came across the other day. Apparently there’s this kind of company which claims that everyone born on the exact same date are the same and they are most fitting. I am about to test out the demos cause you know this appears to be a little sketchy to me but I want to see for myself. The way my love and intimate life is going I am willing to have a shot at nearly anything. Good day homo sapiens! Good web site, although not everything is functioning in the right way! But oh well as that’s up to this administrator to correct … Anyway, what I decided to share is this website I just now found (birthdate) which implies that true long term relationship is achievable with whose who are born on the same day of the year as you, because all people born on the exact same day are essentially the same! This appears like a bunch of astrological junk to me, however I looked over a couple of of their demonstration video clips and most of the descriptions correspond to people I know closely. I agree with the fact that their En pronunciation could be much better, but oh well, if they really have carried out their research and proved it this could absolutelely change our lives! Take a look. Great idea. I was looking for birthday party ideas, but this one is the money post! PS I read your newsletter. Do I win the Inmod Teak Bowl? I read your newsletter. Do I win the Inmod Teak Bowl? AND I love this idea! Thanks!